This post focuses on Karuturi Global ("the Company"), the world's largest producer of cut roses and an aspiring agriculture company with a presence across India, Kenya and Ethiopia. Before getting acquainted with the Company, it is worthwhile to get introduced, briefly, to the business of rose production. Growing roses is a complex operation. For the pain that goes into the production and the pleasure they grant to consumers, roses are reasonably resistant to recessions. The arenas where they are commonly found; weddings, funerals, home/office adornment, image building, expressions of love et al are typically unaffected by the mood swings of recessions. Over the past couple decades, trade volumes of cut flowers have grown in the high teens. Pricing, however, has largely remained tepid. Roses enjoy relatively stable long-term demand, generate good margins and above-average returns on invested capital. Europe is the largest consumer market, accounting for over 50% of global cut-flower consumption. Other major markets include USA, UK, Russia and Japan. Pegged at over $40 bn (source: US Department of Commerce), the global cut-flower business has been a steady grower. A farmer owning 1 hectare of land and contemplating growing roses might look at the following picture. Key levers that influence operational performance are yield, pricing and costs. Historically, it has proved difficult to exercise the Pricing lever consistently. Yield tends to vary and is dependent on a variety of factors such as geographic location, water/irrigation facilities, soil dynamics. A hold over costs and benefits of size become a critical factor in developing a strong moat. As the world's largest producer of cut roses, Karuturi enjoys admirable competitive positioning. Roses are a fragmented market and competition, of any reasonable size to pose a threat to the Company, is low. On the costs front, Africa compares favourably with Europe, where high costs of production are driving producers to convert their floriculture bases to holiday villas. Another critical aspect is proximity to end user markets. Africa's proximity to Europe and India's to Japan bestows distinct advantages on the Company in catering to two of the largest markets in a cost-effective manner. Roses reach end consumers through various channels. Primarily, the auction markets in Netherlands witness frenetic activity and account for ~40% of roses moving in Europe. Roses are also sold to bulk distributors, retail chains and bouquet makers. An insight into the company's evolutionary history makes interesting reading. Karuturi entered the floriculture business as Karuturi Floritech in 1994 in India, with an annual cut-roses production capacity of 7 mm near the city of Bangalore. Late 90s and early 2000s: Changed its name to Karuturi.com in 1999. In 2001, it obtained an internet service provider license and rechristened itself as Karuturi Networks. Operational performance was anything but boast-worthy with the company swinging from profits to losses and vice versa. Though revenues grew at a compounded rate in excess of 90%, after-tax profits flip-flopped between Red and Black. Free cash generation was lacklustre. c.2002-2007: Grew as a floriculture company focused on rose production. Roses were produced in India and exported to Europe, Japan and Russia. Revenue grew from रु.10 Cr in 2002 to रु.45 Cr in 2006. Net income swung from losses to रु.15 Cr, achieved on a capital base of रु.45 Cr funded with negligible debt. Operational performance was noteworthy during this phase, with strong growth being achieved with improving profitability and returns on capital (>40% ROIC). Revenues CAGR was 60% while EBITDA CAGR outran revenues, growing close to 100%. Capital base grew at 75%, as incremental capital was invested profitably. Enterprise value reflected this improvement, growing >40x over this period. Cash burn progressively increased, concomitantly. The Company was morphing into a growth machine. 2007-present: It enhanced its footprint in rose production with the acquisition of Sher Agencies, a Dutch rose producer (500 - 550 mm roses production) with operations in Kenya in Oct-2007. Purchase price was around $70 mm and Karuturi paid about 6-7x profits for the acquisition, which has turned out well. Through acquisition and expansion, the Company is now the world's largest cut-rose producer. It has since embarked on a flower-to-food transformation. Karuturi is evolving into a global company with a growing presence in Africa (Ethiopia, Kenya). About 600 million rose stems are produced and sold each year across Kenya, Ethiopia and India (small contributor), which find their way into Europe and other export markets. In addition to floriculture, it aims to evolve into an agriculture company over time. The latter business is focused on producing food crops; maize, wheat, rice, sugar, palm oil and soybean. In due course, agriculture is expected to be the mainstay business. Corn and rice produced currently are bought by South Sudan. Revenue CAGR over this period was 60%, EBITDA grew at ~50%. Unlike the previous stage, growth has been achieved on a capital base that has expanded faster, at 70%. Revenues in the most recent year were रु.640 Cr, EBITDA of रु.240 Cr, net income रु.155 Cr, achieved on a capital base of रु.1,900 Cr with debt at रु.560 Cr. Over this period, enterprise value grew to रु.2,300 Cr. Stock price currently is lower than in 2007 but market cap has grown 2.5x, as this period was accompanied by significant equity dilution. The expansionary third phase has witnessed massive capital outlays (about रु.1,500 Cr) as the company acquired land in Africa. The next 3-5 years should see operations expanding to Tanzania with investment outlays of $500 mm. In 2006 (when I first invested in the Company), I was attracted to its high ROIC, lean balance sheet, attractive dividend yield (5%), inexpensive valuation (2x trailing earnings) and growth profile. An unknown company back in 2006, its sheer pace of expansion over the next two years attracted investors like Soros Fund Management, IL&FS Investment Managers and a slew of others, who rode with the stock on its journey from mid-single digits through the early 40s. It also smartly sold convertible bonds (foreign currency convertible bonds, as they are called in India) in two tranches totalling $75 mm at the height of the bull market. c.$39 mm is currently outstanding. It isn’t surprising that investors (foreign investors hold 35%) adore this company. The agriculture premise strikes a chord, especially as Karuturi is essentially an India-domiciled company with operations heavily weighted to Africa, the next expected growth frontier. Over time I have been pruning exposure, though. This is largely attributable to strong share price movement post purchase (8-10x rise), historical (and prospective) equity dilution, compressing ROIC and management. Promoter holding is a little over 18%. There are numerous instances of Indian promoters with relatively minor stakes in their listed Indian entity routing cash to fund overseas projects. Painful experience investing in Indian convertible bonds has impelled me to view such instances with a healthy dose of suspicion. As a mitigating factor, the promoter recently made a preferential warrant issue at रु.21.6/share (5x current share price) which, if fully converted, would take his stake to over 20%. The recent trend of Indian promoters venturing into Africa has been greeted with approval but question marks remain. Overseas companies have been cutting deals with local governments to lease land at throw-away rates. Karuturi has signed a 50-year renewable lease on 100,000 hectares in Ethiopia where its rentals are $1.2 / hectare / year. The Company claims that it managed to cut competitive (extremely) deals as it enjoyed first-mover advantage. Subject to the Ethiopian government’s satisfaction on Karuturi’s execution record in developing the first 100,000 hectares, it would have rights to develop an additional 200,000 hectares. A recent deal by a US company in South Sudan was annulled after a pressure-group activist exposed the one-sided deal. Karuturi has so far remained unscathed but given the low payment rate, the limelight could fall on it in the future. Further, the contract allows the lessor to amend rents at its discretion and includes an exit clause, allowing the lessor to terminate the contact post a 6 months written notice. Even though the Company is in dialogue with World Bank to insure against political risk in Africa, this remains one of the key risks to the business. Some thoughts on the unappreciated piece in the capital structure is in order. Companies in India carry convertible bonds at book value on the balance sheet. When stock prices fall so much as to make the convertible bond's conversion option practically worthless, the convertible needs to be perceived as debt. When redemption comes calling, the book values morph into redemption values (which, in some cases, are far higher than stated balance sheet numbers). Several companies in India (and many unfortunate investors) have had a gut-wrenching experience with this phenomenon in the aftermath of 2008. Total debt outstanding, Sep-2011 = $120 mm, with FCCB making up $39 mm. Split isn't available; as FCCB I is a small amount, it is best to assume all outstanding as FCCB II. Redemption falls due in Oct-2012. Conversion price on FCCB II is nearly 5x current share price. Thus, conversion into equity is a remote likelihood. In this scenario, focus shifts on ability to repay the convertible bond, either through internal cash flow or refinancing. Including the YTM (Yield to Maturity) of 7% p.a on the FCCB II, total amount payable at maturity = रु.270 Cr. Credit situation, next year, should be comfortable with Total debt / EBITDA ~3x and Debt / Equity = 0.5. EBITDA may be ~रु.250 Cr and operating cash flow रु.150 - 180 Cr, next year. Total credit limits available with the Company = $200 mm, leaving undrawn credit lines at $80 mm, or ~रु.400 Cr. A combination of cash flow and refinancing should be able to fully cover FCCB redemption. At current indicated bid/asks, the convertible could fetch a YTM between 32% - 40% for a holding period less than a year. Considering the above repayment scenario and Karuturi's equation with foreign investors in the past, full repayment may be reasonably expected, in the event of non-conversion. Given the weak prevailing sentiment towards equities, an investment in the convertible bond instead of common equity affords a more favourable risk-reward (but is limited to only certain classes of investors). ...that is to say, ability to pay should not pose a problem. Willingness, however, may be another matter altogether. A useful way of thinking about Karuturi's value is to think through individual business. 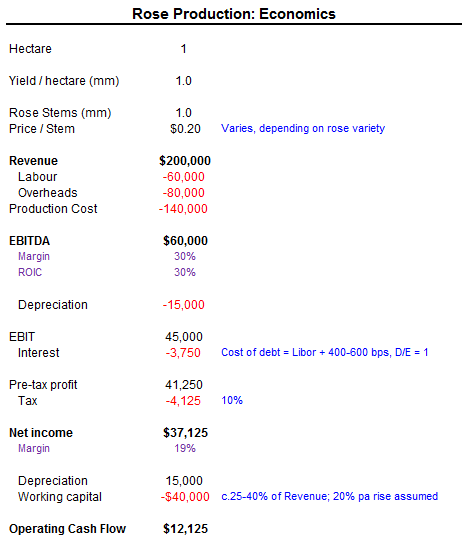 Floriculture: Using an after-tax profit / stem of c.4 cents (above illustration) and rose production at 500 mm stems (2011 production = 600 mm), profits = $20 mm. Rolling 3-year average multiple over the past 8 years = 7x. Using a 4x multiple, market value of the equity = $80 mm, or रु.400 Cr for the stable floriculture business. Agriculture: This business is in nascent stages currently. Beginning with maize and paddy, production of palm oil and sugar is expected over a 3 year time-frame. This year 12,000 hectares of maize and paddy were planted but a flood decimated the entire crop. Hopefully, this will be a non-recurring event. It competes with the likes of Bunge and Cargill in this business, as a result, competitive positioning is weak compared to its strong positioning in the floriculture business. A hectare yields between 1.5 - 5 tonne of crop. Using 2.5 tonne / hectare, 5% after-tax margin and 25,000 hectares under crops over the next 3 years (Company is eyeing 100,000 hectares), this business could generate after-tax profits in the region of रु.15 - 20 Cr, on a conservative basis. At 4x earnings (global agriculture companies trade between 8-10x), this business would be worth रु.60 - 80 Cr. Floriculture + Agriculture = रु.400 Cr + रु.60 - 80 Cr = c.रु.460 - 500 Cr, a broad range of value for Karuturi's equity on a conservative basis. Considering that floriculture capacity is slated to grow 30% over the next couple years (probably sooner) and relaxing some of the assumptions for the agriculture business, intrinsic value has the potential to be far higher than indicated above. Dwelling on the two primary drivers of business, the stable floriculture business is likely to continue ticking at a reasonable rate, while the agriculture business will drive optionality over the intermediate-to-long term. Extend the investment horizon longer to 5 years and above, strong sustained revenue growth is needed (c.20% CAGR) to support stock price. Allowing for compression in margins and pencilling in expected capital outlays, cash burn rate is likely to be high and the Company would be hard-pressed to generate free cash flow. In this setting, as debt burden mounts progressively, further rounds of equity dilution may be warranted (a recently planned GDR issue was shelved due to adverse market conditions). A convertible security offering might enter the picture (speak purely from experience, no mention from the Company). Growth in the pie (business value) looks highly likely, but if there are more claimants on the pie, value of each pie (share price) could languish. Equity holders would be loath to bear the weight of prospective equity dilution (shares outstanding have grown 14x in the past 6 years). A convertible instrument - preferential warrants/preferred shares/convertible bond - seems the best mode of financing prospective growth. In sum, market participant interest (and other interests) in the Company could lead to wild swings in prices. For those who admire momentum, relying on an eager soul to whisk one's stake off one's hands at a higher price in the near-term is likely to be a profitable affair. For those who perceive those pieces of paper as a stake in a business, the rosy road could be strewn with thorns. Position disclosure: Long common equity. Disclaimer: This is not a recommendation or a solicitation of interest in the Company. History is rich with examples of losses triggered from speculative activity in financial markets. Please consult your advisor, and more importantly, your judgement, before investing.